The very picturesque old houses on the canal side of the village always please visitors. The history and calm of the working abbey captures everybody's attention. 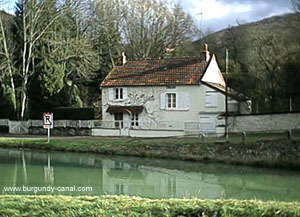 The village is actually split into two very distinct parts, "La Forge" with the canal running through, and on the other side of the Ouche, "La Bussiere", with the 11th century Cistercian abbey. The village still has a post office (open in the afternoons). There is a newly built cafe, replacing a recently burnt down version. The only grocer shop has closed down. This village is an excellent halt along your cruise, the abbey, village and surrounding countryside are full of interest. Due to certain barges provoking generator noise, and a new neighbour, you can no long moor below lock 26, closer than 200 meters. There is a fresh water supply tap just below the same lock, (to the right on the photo below), ask the lock keeper.